The amount of water available to the tap is important when choosing which tap to buy. The cold water supply is at mains pressure so it is generally not of importance. The tap however will require the correct amount of hot water pressure to perform satisfactorily. Domestic hot water systems generally fall into three categories, either "low pressure gravity system", "mains pressure combination boiler" or "Mains pressure unvented". For mains pressure heating systems, the boiler output is typically around 20 psi = 1.8 bar = 18m head. (please refer to your boiler instructions manual for full details) This means most taps should give good flow rates with these types of water systems. Low pressure water heating systems found in older houses generally have a cold water storage tank in the loft and a heater tank on the first floor. 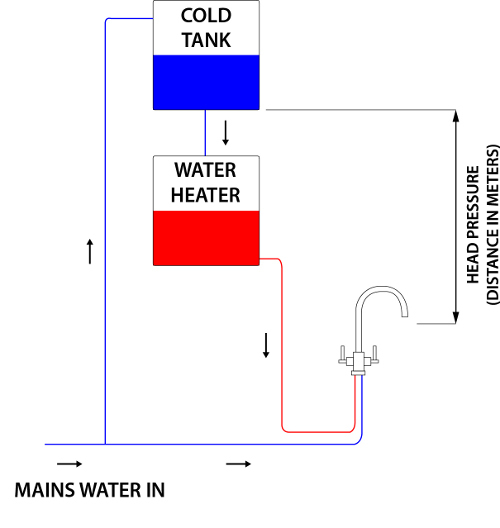 The vertical distance between the header tank and the tap outlet gives an approximate calculation of the available hot water pressure. The diagram shows a simplified un-pressurised system, for example, if the vertical distance was 5m this would roughly equate to 0.5 bar maximum available pressure. Note, if the route the pipes take is not direct, has lots of bends or long horizontal runs the available water pressure will be reduced. In general terms, most single storey houses or bungalows with un-pressurised systems do not suit ?high? pressure taps such as single lever mixers for example. For this reason, our website offer several 'low' pressure mixer taps. Alternatively a booster / shower pump can be fitted to increase the available water pressure, allowing you with a wider choice of models of taps and generally improving the water pressure around your home. Cold water pressure is rarely an issue as it is normally provided from the municipal high pressure supply. If you live in on the higher floors of a tall building or draw your cold water from a private supply you should check the available cold water pressure. Use the stated minimum water pressure in these cases for both the hot and cold supplies.